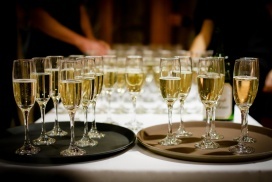 Our champagne reception service is an excellent way to impress your guests at any event whether it is prospective clients, a product launch, rewarding your employees or a wedding champagne reception Crest Events will organise and manage your event for you. Based from Glasgow we cover all of Scotland and Northern England delivery charges will apply however it will be clearly stated on your quote. Our friendly and experienced waiting staff will make you and your guests feel at ease during your event. 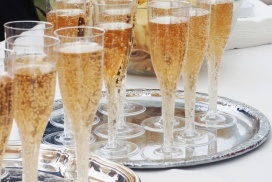 We have a passion for providing a top-class service that will make your event a memorable one. Our staff will set up the tables, chairs and coverings If needed and pack everything away at the end of the event. We remove rubbish leaving the venue spotless. 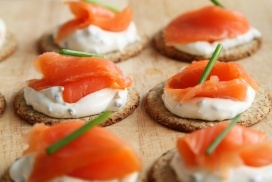 Canapés are an excellent accompaniment to any champagne reception however that is not all that we offer. We have a range of delicious sandwiches and finger food options which will really impress your guests. Have a look at our sample menu or contact us to see what we can offer you. 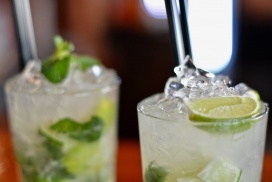 Non-drinkers and drivers will never be forgotten again with our selection of delicious Mocktails. Gone are the drink receptions that only offer apple juice, orange juice and water. The word comes from putting together mock and cocktail and is growing in popularity over recent years. With many different non alcoholic flavours and combinations we make sure everyone is catered for and also shown in our food menu’s as well. Being event managers, we can organise and manage every aspect of your event for you. That includes entertainment, A/V services and if you wish to provide your own drinks we can provide trained staff to serve you and your guests on the day. We feel our services can save your business money by organising and managing the whole event efficiently. Using our services will save you pulling staff off their normal work duties to organise your event. Get in touch to see how we can serve you.